Life in General I'm a retired university professor of English. I taught at Alcorn State University, an HBCU (Historically Black College/University) for thirty-seven years. For twelve of those years I served as Department Chairperson. I loved my job. I loved teaching. Even now I remember how I always loved the "first day" of class when I would meet my new students. As any teacher will tell you, a classroom has a distinct personality. I have always felt that teaching has kept me young...well, young in spirit! But, I have always felt myself to be one of the lucky ones who managed to grab hold of a career and hang on to it. During my tenure at Alcorn, I wrote plays in the seventies and had a few of them produced on the university stage. Eventually I gave up playwriting as the medium of creative expression and turned to fiction. I love poetry but I've never thought of myself as a poet. In the late seventies I attended a writers' workshop at Bennington College, and there met John Gardner and Bernard Malamud. I had work sessions with novelists, Nick Delbanco and Frederick Busch, both of whom were wonderful writers and teachers. The Bennington experience did not translate into book sales or publications, but it was a turning point in my writing life. I returned to the teaching world a different person. In the eighties I got caught up with marriage, children, job and eventually divorce and financial disaster! In the nineties, I earned my PhD in literature and theory from Indiana University of Pennsylvania. There I worked with so many wonderful people such as Patrick Murphy and my dissertation director Karen Dandurand, a truly great woman and scholar. Interesting enough it was during this period, early nineties, that my writing life exploded with activity. I think it's mainly because I have never cared that much for academic research. I know. I know. There were moments when writing literary research that I became excited and all of that, but my great love was fiction. While at IUP, I wrote story after story. I read them at coffee houses, literary gatherings, parties. It was wonderful. With the millennium, I kept writing. My career started winding down, and my writing life began. In 2012, I married a lovely Japanese woman, and I'm learning Japanese. I will say writing is easier. We have visited Japan five times since we've married. My wife's mother lives in Osaka. Essentially, I want to learn Japanese so that I can hold a modicum of conversation with people I meet and especially with my Japanese mother-in-law who is a most fascinating woman. She is eighty years old and gets about like a teenager! Currently she is engaged in her own project of riding every train in Japan. How amazing is that? Sadako, my wife, and I plan to go to Japan in the Fall 2016, about a year from now. Not only is the country lovely, but the people are amazingly patient, kind, and gentle. Most everything about Japan appeals to me. Here's one example: One evening Sadako, her mother, and I were returning from a late evening meal at an Italian Restaurant in Osaka. It was around 10:30 at night. We had to walk a mile or so back to her mother's apartment. I'm talking inner-city here. Half way there we passed several children playing on the sidewalk, laughing and talking. Once we got to the apartment, I realized I had witnessed what to me was a miracle. In a modern city of 10 million, second or third largest in Japan, children can play outside at 10:30 at night! Here in Decatur, a city less than a quarter of a million, parents won't even let their kids go trick or treating without adult supervision. In Japan, guns are outlawed. It's that simple. The number of homicides in Jackson, Mississippi, in one month, outnumbers the homicides in all of Japan in one year. I'm not a gun lover. I don't condemn those who do love firearms. But I must say, the force of the reality that I was walking in a gun-free society was stunning. It still is. And that realization helps me with self-definition as well as my self-cultural definition. Who am I as a human and who am I as an American. It's something to write about. What I like I love writing. I've published one story thus far. "Walter Lee Comes Home from Vietnam." It was published in "The Sun Magazine" in 2013. Since then I've piled up a ton of rejections, but I'm still happily at it. I love reading. I read tons of Asian poetry with a emphasis on Tang Dynasty poets of China. Poet Du Fu is my absolute favorite. I have read everything written by the Japanese novelist Yasunari Kawabata. His novel, The Sound of the Mountain, is, so far as I'm concerned, one of the greatest novels ever penned by human. I wrote my dissertation on Anthony Trollope and must say I still love his novels...all 47 of them! I'm a big fan of the Victorians. George Eliot is at the top of the list. I'm currently reading Elizabeth Gaskill's lengthy novel, "Wives and Daughters." It's not long enough. Movies I love movies, especially International movies. Technology has been a godsend in this arena. In the seventies and eighties, if you wanted to see a movie from Europe or Asia then you had to travel to New York City to do so. Now, all you need is a Netflix account or some such. It's wonderful. The most amazing thing though is between reading and writing, I find it difficult to sit in front of a screen watching a two or three hour movie. Photography I came to photography late. My faculty gave me a camera as a parting gift. It was a huge surprise and I soon got taking nature pics. I lived in the country in Mississippi...deer in the front yard and all that...it was nice. I also had a pond so there were wood mallards and herons...and my life as a nature photographer was on its way. It has taught me patience. Other Hmmm, I am a moderate drinker. I love to sit out on our deck at midnight with a bottle of sake or wine or both and the temperature around 65 to 55, and with a log fire in the fire pit, and watch the moon rise from behind the trees. Autumn is my favorite season. With the temp between 50 and 65 degrees, I feel as if I can sit out on the back porch and write forever. With the temp between 30 and 49, I can sit inside by the gas log fire and forever again. Yes, I'd love to have a "real" fireplace, but what can I say. We're out in the country but it's a modern house. Nevertheless, I'm insanely happy and fortunate so I ain't complainin'. What’s your Brand? I don’t know, what’s yours? Lately, I’ve been thinking about the issue of “Building my Author Brand.” I’ve read several articles on this sort of thing, but I’ve yet to do it—i.e., construct the Brand that will identify me as a writer. At any rate, I thought about it this morning, and of course like all writers, my mind began to wonder a bit and hence this dialogue. I hope you enjoy it. YOU: Uhm, well, I have a blog. CRUEL AGENT: Is that a fact? CRUEL AGENT: (Bored) How many followers? YOU: Oh, let’s see maybe a couple hundred. Well, (looking up and to the right. Something you’d told yourself not to do because it means you’re lying…which is exactly what you’re doing.) could be more than that, because a lot of them are, you know, car dealers and insurance companies, and stuff. Yeah, more like a thousand. CRUEL AGENT (Leaning back in his chair.) What’s your brand? YOU: (Deer in the headlights.) Brand? YOU: Sure, of course. (Wracking your brain for a brand.) Well, I’m not a sci fi, or mystery writer. I think my brand will have something to do with uhm…I want to write literature, so something literary? CRUEL AGENT: You need a Brand. Something that LABELS you. IDENTIFIES you. YOU: Yes, of course. No, I realize that. I mean…sure. YOU: (Brightening.) Sure. (You look down at the manuscript in the leather portfolio in your lap. When you look up, your agent is lighting a cigarette off a brand of red-hot steel. You hear a sizzling.) Oh? CRUEL AGENT: Bare the hip. It won’t hurt—much. HOMELESS MAN: (Watching you run down the sidewalk screaming.) That’s number seventeen for the week—a record. (Shouts.) Could-a left me some coins! As you can see, I’m having a lot of fun mulling over this branding business, but I suppose at some point I have to get serious and do it. Have you constructed your Brand? Have you thought about it? What sort of problems have you faced when you pondered the notion of “how people will identify your creative output?” Look forward to hearing from you. This entry was posted in Thoughts on Writing on March 21, 2019 by Paul. I love these books. Not so much though that I intend to read the whole work, as did Ammon Shea, in one year, and then wrote a book about it: Reading the OED. I did read his account of reading the OED. So, let’s move on. The British poet, W. H. Auden, was asked what one book he’d wish to have if stranded on a remote and uninhabited island. He responded without hesitation, “the OED.” I believe I understand this fascination with the world’s greatest dictionary of the English language. Here’s why. A few months back, I was working on my novel—I’m currently slaving away on the second draft. Early on in the narrative, my female protagonist begins a relationship with a young man. For her, one of the most fascinating aspects of his character is that he quotes poetry. The first instance of this occurs when he delivers the whole of Emily Dickinson’s famous poem: There is no Frigate Like a Book. I got up and pulled the T-U volume. One downside of this multi-volume dictionary is that one can’t easily pile all twelve volumes next to the keyboard. That’s why I built the stand, but I still have to lug the heavy book to the desk. It’s a small price to pay. Dickinson’s poem There is no Frigate Like a Book was written in 1853. I had not known beforehand the relationship between the words Traverse and Toll. The OED gives us these remarkable and often illuminating examples from known, as well as obscure, sources, that add depth to our understanding of words and their historical usage. The dated, usage samples listed in the OED are priceless, and I often find myself studying those more than the definitions. Admittedly this knowledge didn’t help me one whit with my novel, but it made me feel better, stronger somehow. Oh, and I recently came across this word: canorous. It means Singing, melodious, musical; resonant, ringing. One of the stated examples is from Thomas DeQuincey’s famous work, Confessions of an English Opium-Eater: A long, loud, and canorous peal of laughter. Hmm, maybe I can find a place for canorous in my novel…we’ll see. A quick note: I don’t always use the OED. I more often than not work with the smaller and more manageable Merriam-Webster’s Dictionary. Do you find yourself on occasion thumbing through the pages of your good, old dictionary and finding some nice surprises? This entry was posted in Thoughts on Writing on March 5, 2019 by Paul. Many of us writers, including myself, have written on current issues regarding electronic communication networks. We have delved into our love/hate relationship with the world of hi-tech: the wonder of it all—the speed, the ease of use, the universe at your fingertips, as opposed to the horror of it all—the waste of time, the manic distractions, digital unreality. Today I’d like to discuss even yet another dimension we writers must deal with and that is: writing technology. For example, I’ve just completed a scene in my novel (I’m working on a 2nd draft revision.) that involves I-phone use. The scene had to do with the heroine having to use an incapacitated person’s cell phone to make a 911 call. She needs to use his phone because her own phone battery is dead, and she has misplaced her charge cord…something I do all the time. She’s not at her own home, so the missing cord is her only charge method. Now here’s where it gets complicated character-wise. At first, I was going to have her NOT call 911, but I quickly realized that was out of character. She has her flaws, but for her not to call 911, even when the incapacitated person is reprehensible, would flip her moral compass to the extreme. So, she must call, and she does. Enter the plot problem. I’m working with a two-year old first draft. I had forgotten what comes next. In my first draft, she doesn’t call. She asks her ex-boyfriend to call. And now I realize that to avoid my heroine from looking like one who is a moral coward, I need her to make that call, but I also need her, for the sake of my plot, to ask her boyfriend to make the call. What to do? Google to the rescue. I Google “911 calls that fail.” It turns out that 911 has yet to be able to locate all cell phone calls as opposed to landline calls, especially in rural areas—such as my heroine’s. It all works out. She makes the 911 call. The 911 rings—stops, and a CALL FAILED message pops up on the screen. So now, she must call her ex, (which is what I want her to do) and ask him to make the 911 call on his landline. Whew! After writing this scene, I realized just how much of this novel, set in 2019, has required use of current technology from I-phone use, including Skype and FaceTime to Television-computer-telephone hook ups and everything in between. Here’s a real-life narrative. Some years ago, I was involved in a relationship with a woman who professed herself to be a Republican, Christian, conservative. Upon her first visit to my humble home in Mississippi, she let me know that it was a major disappointment. My home was not up to her high standards. Her two children from a previous marriage, both in their early teens, did not agree but knew better to argue. They left after two contentious days of bickering, back-biting, and arguing. I remember my epiphany: that the relationship was headed south. I waved good-bye as she pulled out onto the highway. Back inside, I poured a hefty glass of Merlot from the bottle I had hidden during her short visit. I picked up my remote to check the weather on my 52” flat screen. What immediately popped up was GOD TV. Until her visit I had no idea such a thing existed. It was all she watched. I hit the channel button—nothing happened. I hit it again. Again. Again. To my horror, I realized she, or her tech-savvy, fifteen-year old daughter, had locked my television on GOD TV. I had no idea what to do. I called a good friend who told me to pull the plug wait a few seconds then plug it back in. The TV would reset to its default position. I did, and it worked. I used this real-life episode in my novel. So, have you found yourself in a tech-related plot problem? How did it turn out? I hope to hear from you. This entry was posted in Thoughts on Writing on February 26, 2019 by Paul. 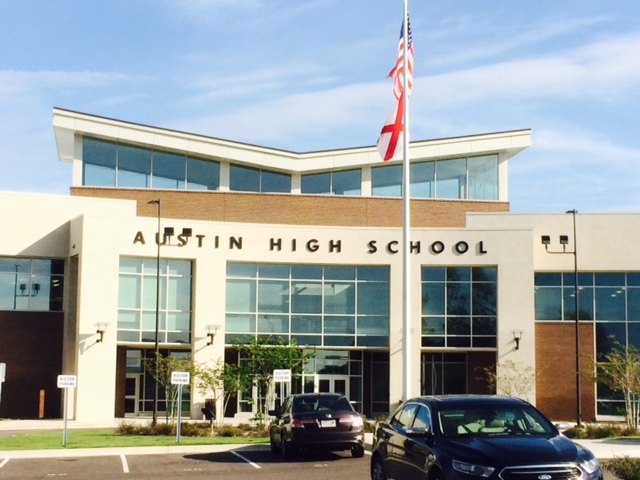 Decatur has opened a new high school: Austin High. The new high school had an “open house” for the public a few months back, and my wife and I decided it would be interesting to go see how it looks. How is it different from schools of ancient times, that is to say, when we were teens? I was also curious from a writer’s standpoint. I was, at the time, rewriting the chapter where my biology teacher protagonist is wrapping up her school year and cleaning up her science lab; hence, I definitely wanted to check out the science lab. We found it quite easily. Sadako’s first comment was: “It looks like the science lab I went to.” I could only agree. It looked exactly like every high school science lab I had ever seen. There were maybe six or seven stations with black tops. (We had those in 1966.) Each station included a sink, water spout and a gas line. There was a line of storage cabinets along the wall. Cabinets no one could reach. We moved on. The gymnasium was nice—but again, no surprises. Classrooms were…classrooms. The seating for students was interesting. The two-seater desks seem to suggest collaborative effort, which is a good thing. I thought the plant and the lamp on the teacher’s desk gave the room a nice homey touch. 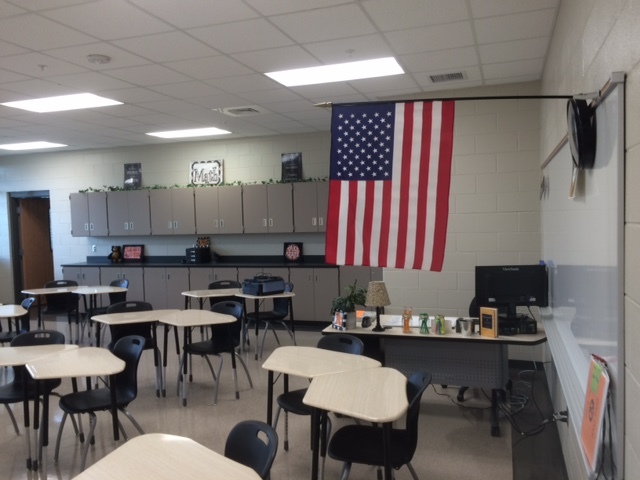 What I felt was a bit odd was that in every classroom, as seen in the Math classroom below, hung a rather large American flag. Is the jingoism necessary? Do our millennial students need to be told every second of the day that this is America? It just seems a bit much. “Ah.” We were pointed in a general direction. And after a few wrong turns…we found it. Dear friends, dear blogger friends, let us join hands and bow our heads and grieve together. How sad it was. How disappointing. How utterly pathetic. Words fail me…. As you can see, books are NOT the emphasis here. In fact just to look at the titles you have practically crawl on your hands and knees. The tables that seat five students have computer hook ups. I’m not sure if that means that students bring their own laptops or if the school provides such, I don’t know. The wall of windows is interesting. I think its purpose is for students to hand signal each other—that it’s time to go! I took a “closer look” at the books themselves. A general subject section revealed a very cozy set of books. For instance, one can see the engaging title: Thanksgiving by Appelbaum. Now whether or not a millennial student is hot to check that one out, I can’t say, but I wouldn’t bet on it. But let’s move on to the literary section. This was a hoot. I was happy to see Joseph Conrad’s collection of stories, but why is it sitting next to Toni Morrison’s two novels: Song of Solomon and The Bluest Eye? And why are Toni Morrison’s works next to Heller’s Catch 22? And then, I Heard the Owl Call My Name, which was published in 1980. Authored by Margaret Craven, it’s a novel that chronicles life of Native Americans of the Pacific Northwest. Okay. The fact is the books are a hodgepodge, hit or miss collection, all out of order, as if they were simply shoved onto the shelf straight out of the moving boxes, revealing the obvious fact: nobody gives a damn. Sadako called my attention to a Japanese novel. I rushed over to see if they had my favorite author, Yasunari Kawabata. No, they didn’t. They had a manga. High School Debut. As you see it addresses the question: Who doesn’t need a love “coach” in high school? It looked as if it had been checked out quite often! The sad fact is, in this particular high school, grades ten through twelve, the library, whoops, Media Center, is not a place that even remotely encourages the reading of books. If I were a student would I choose to read High School Debut over, say, Toni Morrison or Joseph Conrad? Of course I would. That’s my point. I had teachers who could and did direct my reading because I didn’t know what was out there. I don’t have a problem with a student reading High School Debut but I also want them to read Toni Morrison’s The Bluest Eye or The Yearling by Marjorie Rawlings or Native Son by Richard Wright. Is it too much to ask? 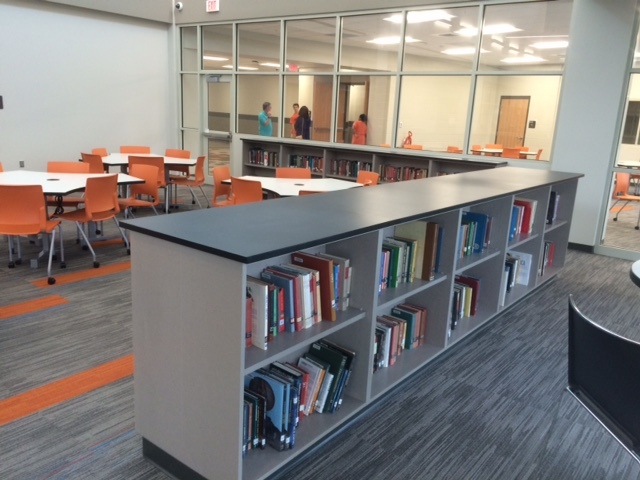 What are your thoughts on the purpose or need for a school library? Should it be there or abolished altogether? This entry was posted in Thoughts on Writing on October 2, 2018 by Paul. But then, when were we ever NOT in “troubled times”? The thirties and forties? Depression and World War. The fifties? Racism and McCarthyism. The sixties? Assassinations and Vietnam. The seventies? Drugs and serial killers. The eighties? I don’t even remember the eighties. The nineties? Techie Takeover. The millennium? Okay, okay. It’s a hard life. So here we are: September 2018, with our Democracy standing on the razor’s edge. Will we survive this insanity? Or will we slowly? quickly? descend into a fascist state? I agree with Michael Moore, I don’t think it’s impossible. We all get up, make ready for the day, drink our coffee, watch the depressing news, get into our cars, and for one reason or the other, sally forth into the world. Can this typical day come to an end? Yes, it can. The idea—imagined or otherwise—of a normal life style coming to an end is what we writers write about. It’s the only thing we write about. We know this intuitively. Someone dies or doesn’t! Someone travels or not; answers a call or hangs up; falls in love or gets dumped; gets married or divorced; or as recently in my case, receives a notification. I got a letter from my pharmacy. Here’s the situation. I take two pills every morning: one for high blood pressure, Valsartan, and another for some mysterious pain in my back. For all I know that pill is a placebo. At any rate, the letter stated that my current high blood pressure medicine, Valsartan, “may be linked to risks of developing cancer.” It went on to say that “short term use is low” for developing any health issues. I’ve been taking the damned thing for ten years…Jesus. So, I responded as you might expect. I FREAKED OUT! Especially when the letter stated, “patients taking the recalled Valsartan medicine should continue taking their medicine until they have a replacement. Oh, right, just keep taking the killer pill “that’s linked to risks” until they figure out what to do. Great idea. Thank you for that winsome advice. So, I staggered like a doomed duck from one room to the other. What to do? What to do? I finally settled down and re-read the letter. There was a website I could go to and check whether or not the big pharma lab that made MY med was one that had produced the “compromised” Valsartan. I did just that. The company listed on the bottle is Alembic. I’ve never heard of them. It turns out that Alembic’s Valsartan is okay. It doesn’t contain the carcinogenic element. Well, that was good news. I still have about two weeks left of the current pills, so I keep taking them. I do feel better. I feel much better. I finish the pills. I get a notification from my drugstore. The other prescription is ready, but the Valsartan isn’t ready. I ask about that. The druggist says my “care giver didn’t call it in.” I felt like being sarcastic, but I meekly tell him thank you. I’ll go to the doctor’s office and see what’s going on. I do that—post-haste. The receptionist behind the window in the crowded waiting room tells me that Valsartan isn’t listed on my chart or whatever she’s looking at. I respond (nicely, politely) informing her that I’ve been taking it for years. “It’s not there,” she says. Then she tells me that I was supposed to have come in for a check-up back in June. WTF is she talking about? I tell her that I didn’t remember such an appointment. I wasn’t given an appointment reminder. She repeats. “You were supposed to come in June. That’s what it says. It’s now September.” She stares at me with her mouth hanging open. It’s all my fault—obviously. “You want to make an appointment? The doctor does want to see you,” she smirks. She could win an award for MOST CONDESCENDING. “Yes, please,” I say. I’m fighting off reptilian urges. The next day I show up at the doc’s office. A student assistant comes in. She’s a very pretty young lady from India. She’s so nice. Asks me how I’m doing. I tell her I’m okay, but I mumble about the pain in my legs. Neuropathy, I suggest. At her suggestion, I remove shoes and socks. She checks the pulse at the top of my foot. It’s good. She gives me a quick response test by pricking my feet with a prong. I pass the test. I like that. Give ‘em hell, Doc. My drug is okay they tell him. “Thank you,” he says. He hands the smart phone back to the assistant. “Yes sir,” I say. He tells the pretty assistant to go check on another patient. I thank her for her concern. I go to pick up my Valsartan. It’s not ready. I go back later. It’s still not ready. I go back a third time, and they are all smiles and hand me my newly filled prescription. All is well. I get to my truck where my black lab, Cody, sits. He leans against the door on the rider’s side. He’s a great dog. I sit there in my truck. Cody’s panting, ready to go home. I watch an incredibly heavy man with long gray hair struggling to get out of his car. It’s very difficult for him to turn in his seat. At one point with one foot in and one foot out, he stops to catch his breath. Finally, he emerges and starts shuffling toward the store. Cars stop for him. Everybody stops for him. We all feel for him. Ah, what a day. I’m fortunate. I know I am. I think about the patients who had been taking the “compromised” Valsartan. I hope those people are okay. Hope, it’s all we have sometimes. Hope for ourselves, hope for each other. Thank you for reading. I hope to get back to blogging now that summer is nearly done. Ah, autumn. I love autumn. This entry was posted in Thoughts on Writing on September 24, 2018 by Paul. View outside my window here in Madison. Oh, it is spring…right? It’s my last day at the UW-Madison Writers’ Conference. It’s been a wonderful experience. One particular event I’d like to mention was the Advanced Manuscript Critique. I sent in the first ten pages of my just completed novel. A chosen author/editor critiqued the ten pages. In my case it was Lucy Sanna, author of Cherry Harvest, (I highly recommend it.) and at an appointed time, I sat with Lucy, and we went over the critique of the ten pages. Let me say right off the bat: Lucy Sanna is tough~! I consider myself extremely fortunate. She gave me great feedback, which will make my novel better and stronger. At one point during our talk, she asked, “What’s the word-count of your novel?” I responded firmly and proudly, “One hundred twenty-three thousand.” “That’s too long.” was the immediate response. She did come back later and tell me that 123,000 is acceptable for a debut novel…a million words is acceptable for a debut novel if it’s “GREAT.” But the magic number it seems for the reading public is 90,000 words. ( the range being 80,000 –110,000) I had no idea. So, it’s stuff like that, along with the great sessions on the craft and business of writing that make a conference worth a writer’s time. Regarding my word count, the good news for me is, that it’s a lot easier to delete than it is to add. The great debate through out this conference has been between Traditional and Self-publishing avenues. As we all know the self-publishing world has “taken off” in the past five or so years and many authors have taken that route and quite wisely so. I’m still not sure whether or no I want to go the rather torturous agent route: Your query letter has to be perfect. They may never get back to you…probably won’t. If they reject you, consider yourself rejected forever. If there is one error, you’re doomed. You need to know exactly what it is they want…maybe even their favorite wine. It gets strange. And I haven’t even gotten to the part about their 15% cut of whatever you earn…if you earn anything. In fact getting an agent doesn’t necessarily mean publication…and even if you do get published, you still have to be your own publicist. So, the argument goes…why not simply skip all the anxiety and go self-publishing and take control of your own game. It’s a fascinating world out there. So, it’s the final morning of the conference. I’m staying one more night to get past the bad weather. When I left Alabama it was big time Spring–roses budding out, day lilies starting to bloom, lovely white dogwoods in full bloom and seventy-six degrees. Here it’s cold, very windy, and snowing. Wha? Nevertheless, it’s been a great time. And thanks to all of you for the really nice words. This entry was posted in Thoughts on Writing on April 15, 2018 by Paul.